Many students have certain physical or emotional conditions that would classify them as special needs. Whether they have ADD, Aspergers, anxiety, or any other situation, these students are finding it impossible to function in a school environment, or even attempt to learn the way traditional students would. It takes a special kind of person with the right educational background to help these humans reach their goals and find success. If you’re considering a career in special education, there are many different options to choose from. Find out about special education careers from teaching and beyond. Empathetic, patient, fearless, flexible, and dedicated are all words that can be used to describe the type of person you are. If you’re interested in special education, then those are all traits necessary for a successful career. Never underestimate yourself. You’re amazing to heed this calling. Because a calling is what it is, and special ed careers are not a good direction otherwise. Working in special ed comes with obstacles and triumphs. Your mission is to help your students or clients thrive in ways they otherwise wouldn’t. You’re giving people the tools they need to succeed, whether helping a student learn to focus or translating the spoken word to sign language, and beyond. 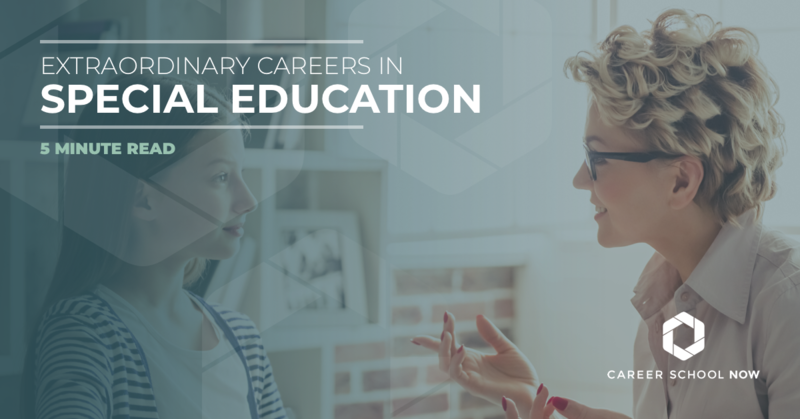 Despite the fact that your education will prepare you for the technical aspects of your career, there are still some things you need to know when heading into a career in special education. It will be stressful. In general, working to help others can be stressful. When you compound that with the emotional and physical needs of those in your charge, it can be overwhelming. There are days when your patience and kindness will be tested and trying to remain calm will be, well, trying. Your limits will be pushed. Every single one of your limits. Pushed to the max. You may drown in paperwork. With every special ed student, patient, and client, there is paperwork equal to, if not greater than, his or her body weight. Evaluations, reports, Individualized Education Programs, meeting invitations, and so much more, need to be filled out. You may get very emotionally attached. So many special ed professionals get very involved in the lives of their students/clients. It’s almost impossible not to. You celebrate the wins and cry at the setbacks. Because you’ll be communicating with many others included on the team of professionals, you’ll be diving deep into lives, and it’s only natural to form an attachment. You’ll be rolling with a lot of punches. Which means you’ll need to be good natured and adaptable, even when it feels like you’re about to snap. Your easy-going and flexible nature are called upon often. Caution, uphill battle ahead. Your students or clients are going to be giving it their all. But, their all may be limited, and you’ll be doing a lot of the same things over and over, until they’re able to catch on. When you get to the top of that hill, you can catch your breath and celebrate the successes. You may be extremely satisfied. As frustrating as some of the instances can be, you’ll find tremendous satisfaction when your students or clients reach milestones and breakthroughs. There are many different paths you can take—and degrees you can get—if you want to work in special education, from a bachelor’s degree to a doctorate. Recreational Therapist: You’ll use arts, crafts, music, dance, aquatics, and other modalities to help people with disabilities, injuries, or illness. A bachelor’s degree is necessary. Certification is preferred by most employers. There is a 7 percent (1,300 new positions) employment growth through 2026. Translation for the Hearing Impaired: You’ll translate the spoken word to sign language for your hearing impaired clients. Bachelor’s degree and fluency in two languages is required. In this case, that’s English and ASL. Certifications are available through the National Association of the Deaf as well as Registry of Interpreters for the Deaf. An 18 percent employment growth for interpreters and translators is expected through 2026; this includes American Sign Language translators as well. Occupational Therapist: You’ll help patients with disabilities learn, develop, and recover tasks they’ll use in everyday life. This is done through exercises, special equipment, and other forms of relevant therapies. A master’s degree in occupational therapy is required. To be an aid or assistant, hands-on training and an associate degree are recommended. Each state may have its own licensing requirements, but it is essential to meet whatever yours are. Median salary is $84K for occupational therapists. Some 31K new jobs will open between now and 2026. Physical Therapist: As a physical therapist, you’ll be trained to use different forms of exercise to help your patients manage their pain and improve their movement. A doctoral degree in physical therapy is required. Every state in the U.S. requires PTs to be licensed. There will be over 67K new positions opening through 2026. School Social Worker: You’ll work with students and help them tackle situations that occur in their lives. Bachelor’s degrees are the minimum requirement for entry-level social work positions. Licensing is required, and you must have a master’s degree and two years of experience to obtain a license. There will be over 45K social social worker positions opening through 2026. School Psychologist: You use your study and observation of social, cognitive, and emotional processes to help improve the students’ behavior. A Ph.D or Psy.D are required. Licensing is required in every state. Some 21,000 new positions will open through 2026. Speech-Language Pathologist: As a speech therapist, you’ll help with swallowing and communication disorders with children. A master’s degree is necessary, at the very least. Licensing or registration will be required, depending on your state. Close to 26K jobs will be available through 2026. Audiologist: You’ll diagnose hearing, balance, or other ear problems. Many audiologists work in doctor offices and clinics, but there are also many who work in school districts traveling between schools. A doctoral degree in audiology is required. Licensing is required in all states. This small (yet mighty) occupation will have 3,100 new job openings through 2026. Special Education Educator: You’ll teach students with moderate to severe emotional or physical disabilities. A license to teach at each grade level is necessary. From pre-K through 12th grade, over 33K positions will open through 2026.